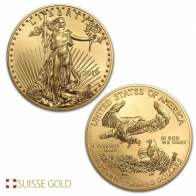 The American Eagle gold coin was initially released by the United States mint in 1986. 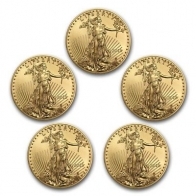 The coin is manufactured in 4 sizes - 1 Ounce, 1/2 Ounce, 1/4 Ounce and 1/10 Ounce. 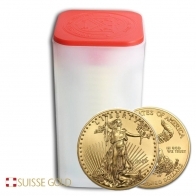 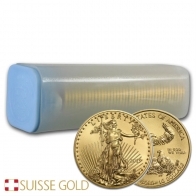 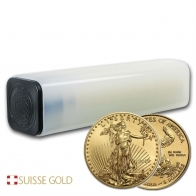 The American Eagle gold coin is 999 fine investment grade gold bullion, or 22 Karat. 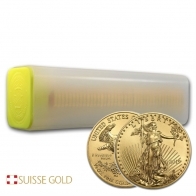 Each coin features the image of Lady Liberty on the front, running with an olive branch in one hand and a torch in the other. 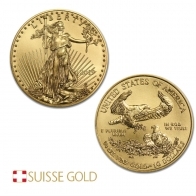 A small depiction of the US Capital building is located on the bottom left of the coin. 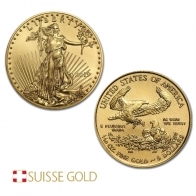 The reverse side of the coin features an image of a male Eagle bringing some branches to a female eagle who is sitting in her nest. 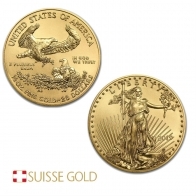 In addition to the gold American Eagle series, the US Mint also produces the American Eagle coin in silver and in platinum.